Reference number for this case: 16-Oct-54-Camaret. Thank you for including this reference number in any correspondence with me regarding this case. 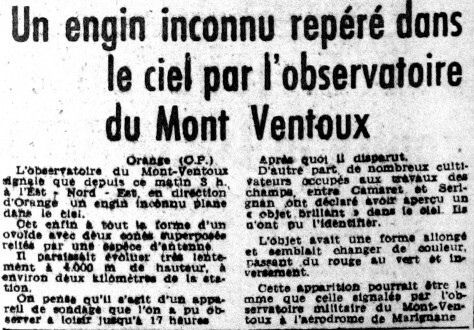 The observatory of the Mont-Ventoux announces that since this morning 8 a.m. in the East - North - East, in the direction of Orange, an unknown craft passes in the sky. This apparatus has all the form of an ovoid with two superimposed cones connected by a kind of antenna. It appeared to evolve/move very slowly at a 4.000 meters height, at approximately two kilometers from the station. It is thought that it is a sounding device; which one could observe with leisure until 5 p.m. 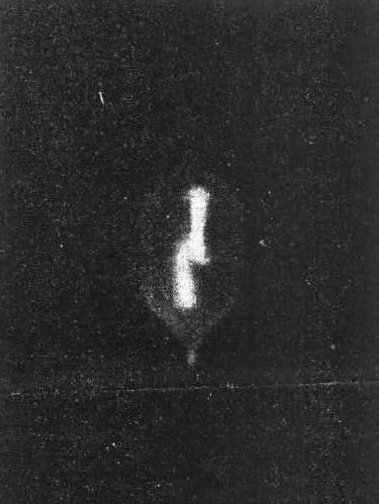 In addition, many farmers occupied with the agricultural work, between Camaret and Serignan, stated to have seen a "shining object" in the sky. They were unable to identify it. The object had a lengthened form and seemed to change color, passing from the red to the green and conversely. This appearance could be the same one as that announced by the military observatory of the Mont-Ventoux to the airport of Marignane. This was likely another observation of the high altitude balloon spotted that day from the Mont Ventoux observatory. [lp1] Article in the regional newspaper Le Provençal, France, October 17, 1954. 1.0 Patrick Gross October 13, 2016 First published. This page was last updated on October 13, 2016.